Three hooligans involved in last month's MDC-Alliance-sponsored violent demonstrations wrote their own scripts of the popular television series "World's Dumbest Criminals" after they were given away by a social media video, a text message and self-rubber-stamped markings on the face, in separate incidents. The three - Samuel Kapote, Takemore Bhunu and Steven Sango - will spend one, four and three years in jail, respectively. Kapote, who became a social media sensation for all the wrong reasons when a video of him carrying a beef hindquarter went viral on social media, was identified by a responsible citizen. Bhunu was nailed by his own text message inviting a friend to come and share the groceries "talooter muChoppies" while Sango and his partners in crime stamped their faces and arms with an official Government rubber stamp after invading a Vehicle Inspection Department depot. While his co-accused were discharged for lack of evidence, a clumsy Sango, who dropped his ID at the crime scene, was left to face the music alone. Kapote, who pleaded guilty, was sentenced to a year in prison by resident magistrate Mr Nyasha Vitorini. 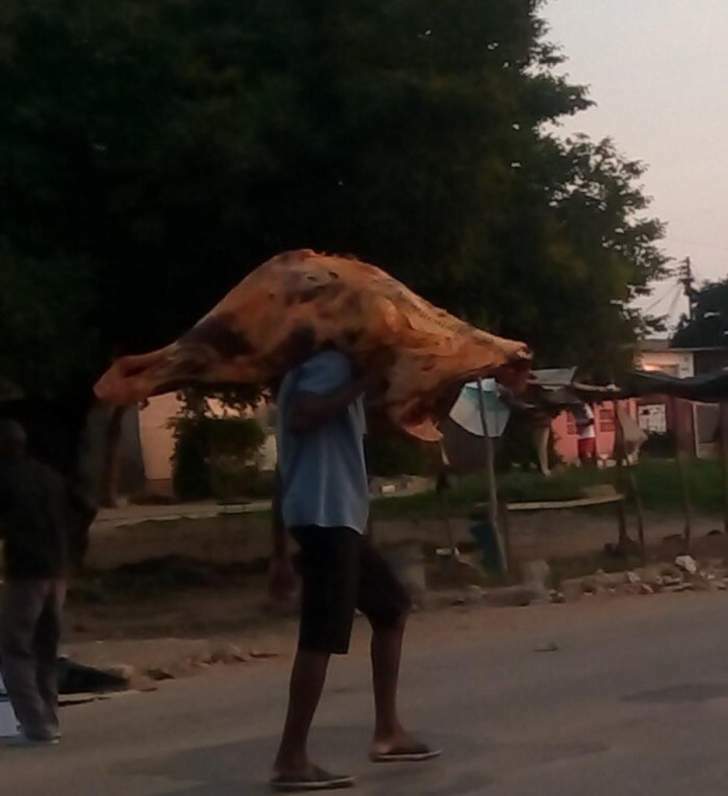 The hindquarter, worth $594, was looted from Choppies Supermarket at Chitungwiza Town Centre. Mr Vitorini initially sentenced Kapote to two years in prison but suspended a year on condition that he does not commit a similar offence. Prosecuting, Mrs Ntombikayise Nleya-Mtlongwa proved that on January 14, Kapote, acting in concert with others, invaded Choppies Supermarket and took 60kg of beef. The matter came to light after the police received an anonymous call from someone who had identified Kapote from the video. He was arrested at Chimubayira Complex in Unit H where he claimed to have only offered to assist someone to carry the beef which they eventually shared. Bhunu (27), from Harare, was also sentenced to four years in prison after he was convicted for looting groceries at the same Choppies supermarket during the demonstrations. Bhunu and Godsave Mukore (25), who were represented by Miss Tinomuda Shoko of Zimbabwe Lawyers for Human Rights, were charged with public violence and theft when they appeared before magistrate Mrs Blessing Murwisi. Prosecutor Ms Tendayi Shonhayi told the court that on January 14 at around 11am the two were involved in the vandalism of Chitungwiza's only traffic light situated at Unit C Junction and looting of groceries at Choppies Supermarket. Mukore was, however, acquitted after the State failed to prove its case. Bhunu was convicted and initially sentenced to five years in jail but one year was suspended on condition that he does not commit a similar crime in the next five years. Ms Shonhayi proved that the accused person and others who are still at large sold some of the looted groceries to passers-by and hid part of the loot along a stream behind Tafa Shopping Centre in Unit D.
After Bhunu was apprehended on January 14, the police only recovered a 2kg pack of flour as the rest of the groceries had been taken away by his accomplices. A text message found on his mobile phone from the day of the incident where he was telling one Norest to come and collect the looted goods, also gave him away. It read: ". . . meno kwaari huyai mutore grocery, talooter muChoppies". Meanwhile, Sango (24) was slapped with a three-year jail term for committing public violence by Mr Vitorini. Sango, from Chitungwiza, was initially jointly charged with Sandurai Nyatete (20) and Spencer Mudzingwa (22) but Mudzingwa was discharged at the close of the State case while Nyatete was acquitted after a full trial. Prosecuting, Mrs Nleya-Mtlongwa proved that on January 14 at around 2pm while a Sergeant Jeko and others were on duty at the VID depot at Makoni Shopping Centre, they came across Nyasha Chiyangwa in the company of Mudzingwa exiting the department's premises. The police noticed some rubber stamp markings on their faces and arms but Mudzingwa ran away. Upon interrogation, Chiyangwa indicated that he had been stamped by Mudzingwa after they broke into the VID offices. He also revealed that they had looted some shops at Chitungwiza Town Centre. He led the team to Unit F where they located Mudzingwa and arrested him. Mudzingwa then implicated Sango. Police recovered a swipe machine, desktop computer and some groceries, while Sango's national identification card was found at one of the offices at the VID depot.